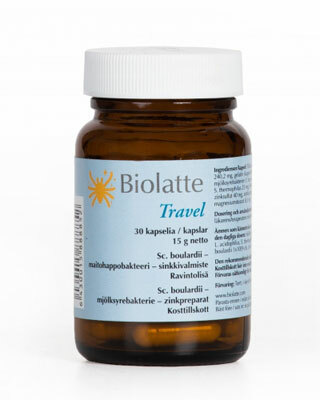 Dietary supplement for the traveler. Product packaging: 30 capsules, 15 g net. Bulking agent (microcrystalline cellulose), gelatin (bovine), Saccharomyces boulardii, lactic acid bacteria: E. faecium, L. acidophilus, S. thermophilus, Bifido bacterium Bb-12, zinc sulphate, anticaking agents (silicon dioxide, magnesium stearate). 1 capsule a day to be taken with water to an empty stomach. We recommend to start one week before the travel and continue during the entire trip. Lactic acid bacteria: E. faecium, L. acidophilus, S. thermophilus, Bifido bacterium Bb-12, Sc. boulardii, zinc 14,6 mg (146 % of the recommended daily amount). Sales authorisation in the EU (number AS 2251/4).